Finally! An alarm schedule app designed for specifically competition BBQ. iPhone users can run 180Que? 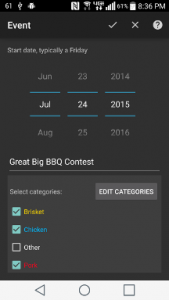 You miss one checkpoint on your competition BBQ schedule timeline and it can cost you dearly! 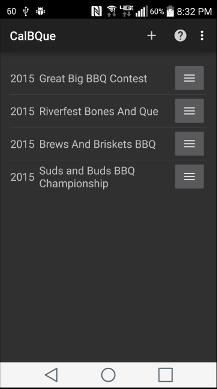 It happens to every comp pitmaster, it’s only a matter of time. 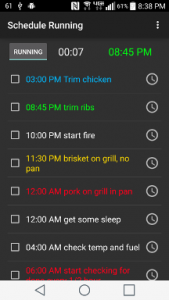 180Que solves this problem – it’s an automated alarm app that runs your schedule and much more. Maybe you need to adjust your schedule on the fly, or add things to do, collect notes during your cook etc. It’s all there. 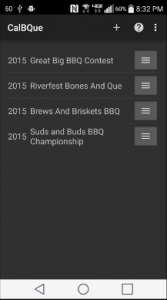 180Que was developed by / for competition BBQ pitmasters. 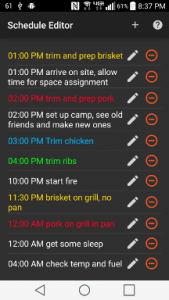 The user interface is optimized to make cook schedule creation as fast and easy as possible. And you do this exactly ONE time. 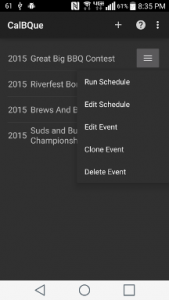 After that you simply clone and edit schedules – easy as that. 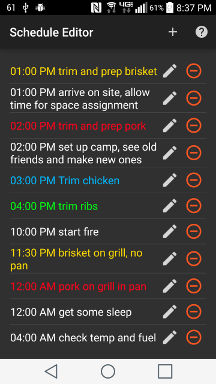 If 180Que is missing a BBQ schedule feature then just let us know – using the built in Support & Suggestions messaging feature. After installing: Once installed, take a close look at the two sample schedules that are automatically created for you. If they make sense, then create a new event for your next competition and start entering all the items for your timeline. You only need to do this ONCE – that’s right, because you can clone this event for following events. Edit as needed and, you’re done! Speaking of changing time, if you change the time of any schedule item, 180Que asks if you want to apply that change to the rest of the schedule – Now that’s a time saver. Older devices: If you have an old Android phone in a drawer somewhere, odds are it will work just fine. You do not need data connectivity or use 180Que. You don’t have to worry about your daily phone getting lost, breaking or greasy. Reset that old phone to factory default and run through the simple installation steps below. Note: 180Que does not collect any data from your device what so ever! The only reason network permission is needed is for crash reports that help us understand why 180Que might have crashed. Please see the ‘Explanation of permissions’ section below. Note: After you click through ‘Become a beta tester’, Google Play needs a minute or two before you can download. Users report “Item Not Found“ message from Google Play. Just give them a minute to catch up and the download should work. 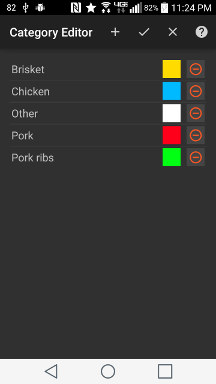 New: Access Wifi State – One of the new 180Que Pro features includes loose integration with WiFi BBQ Guru and Stoker systems. Read phone status and identity – This is needed so phone calls aren’t rudely interrupted with an alarm going off in your ear. Disable your screen lock – We need this so we can turn your screen on and overlay your keylock when an alarm goes off – saves you those steps. Full network access – This is for crash reporting only. Your schedules stays on your device, we do not collect any data other than stack trace in the event of a crash. 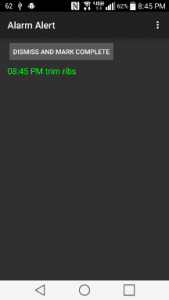 Run at startup – If your phone reboots we need to automatically resume your schedule if it was running. Control vibrating – You can turn vibrate on independent of alarm volume. Prevent phone from sleeping – This is part of the same permission for turning your screen on when an alarm happens. Modify system settings – Goes along with setting vibration mode. Enjoying the app, thank you! Can you tell me how to change the default IP address for the guru? For whatever reason I can’t click the menu in that screen. Hi shafferandy, Stoker can be used as a node on the network or as an access point. 180Que simply uses a webview to display. If you can get to the Stoker with your browser, you can do it exactly the same way in the 180Que Stoker view. 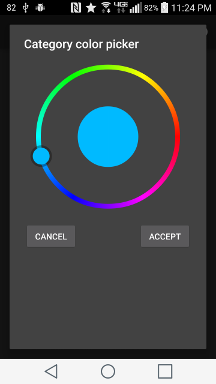 It is possible to export a file but is it also possible to import a file in to the app? Hi Danny, this is probably the biggest question I get. Android security makes it difficult to do this without doing some Enterprise type version. Maybe someday.